The smallest state of the union, Rhode Island, also has the longest official name of any of the states: "State of Rhode Island and Providence Plantations". The state is one of the most densely populated and heavily industrialized for its size. For a state that is only 37 miles wide and 48 miles long, it is notable that its shoreline on Narragansett Bay in the Atlantic Ocean runs for 400 miles. Indeed, one of Rhode Island's nicknames is "the Ocean State." 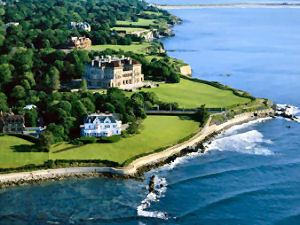 The legendary mansions of Newport overlook the ocean at Narragansett Bay. Many of these spectacular homes are open for tourists and offer an inside glimpse into the lives of America's high society. The Breakers, the magnificent Vanderbilt mansion built in 1895, is one of the most elegant private homes that has ever graced the Newport shorefront. This state was named by Dutch explorer Adrian Block. He named it "Roodt Eylandt" meaning "red island" in reference to the red clay that lined the shore. The name was later anglicized when the region came under British rule. This nickname was formulated to attract tourism to Rhode Island and appears on non-commercial license plates. "Ocean State" began appearing on Rhode Island license plates in 1972, replacing "Discover." 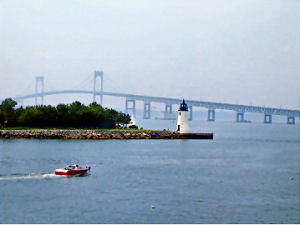 The Rhode Island Tourism Division promotes over 400 miles of coastline. This is not all ocean frontage but includes Narragansett Bay extending inland from the Atlantic Ocean north to the center of the state. All Rhode Islanders live within a 30-minute drive to the Atlantic Ocean or Narragansett Bay. A traditional nickname for Rhode Island, obviously in reference to the state's small size. Rhode Island is the smallest of the 50 states in area. Variations include "Little Rhodie," "L'il Rhody," and "Little Rhode." This name is derived from the state's official name, "State of Rhode Island and Providence Plantations." This sobriquet* for Rhode Island, like the nickname "Little Rhody," is in reference to Rhode Island's size. Roger Williams, who founded Providence Plantation in 1636, is the source of this sobriquet. This historical nickname was bestowed because Rhode Island was the most southerly of the New England states with harbors suitable for ocean-going ships. These harbors allowed New England raw materials and finished goods to be shipped to other parts of the United State and foreign countries and allowed raw and finished goods from other parts of the United States and foreign countries to be delivered to New England. * Sobriquet (pronounced sO-bri-kA or sO-bri-ket) means "descriptive name." People who live in Rhode Island or who come from Rhode Island are called Rhode Islanders. The Rhode Island quarter, released May 21, 2001, honors the "Ocean State" with a picture of a beautiful vintage sailboat moving through Narragansett Bay with the Pell Bridge in the background. Sailing is, of course, the most popular sport in the smallest state in the union. With over 400 miles of coastline and more than 100 fresh and salt water beaches, Rhode Island was home to the Americas Cup for more than 50 years and is widely known as the Sailing Capital of the World. The release of the Rhode Island quarter completes the release of all of the commemorative quarters for the 13 Original Colonies and states. "Today is a great day for the State of Rhode Island. The release of the Rhode Island quarter marks the culmination of a process that involved the public in choosing the themes and, ultimately, the design that will convey our state's heritage to the rest of the nation. The 50 State Quarters Program has given all Rhode Islanders a wonderful opportunity to share our unique character with America." Rhode Island (From Sea to Shining Sea) , by Val Hallinan. 80 pages. Publisher: Scholastic Library Publishing (September 2003) Reading level: Grades 3-5. 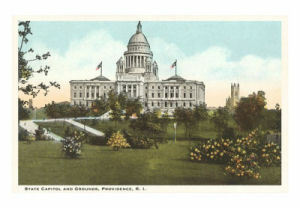 Presents information about Rhode Island's people, geography, history, landmarks, natural resources, government, state capitol, towns and cities, and more. Rhode Island (World Almanac Library of the States) , by Joanne Mattern. 48 pages. Gareth Stevens Publishing (February 2003) Reading level: Grades 4-6. Filled with the most up-to-date information, including the latest Census results. Full-color photos bring to life the story of Rhode Island. In addition to an in-depth factual profile of Rhode Island in the form of a state Almanac, this book offers fascinating and lively discussions of the state's history, people, geography, government, economy, culture, and lifestyles. A section on Notable People, a calendar of events, and enough primary source documents, time lines, maps, and other tools to make this unquestionably the best young adult reference material on the USA available anywhere. Rhode Island: A History , by William G. McLoughlin. 272 pages. Publisher: W.W. Norton & Co. (June 17, 1986) High atop the Rhode Island capitol in Providence, a bronze likeness of "The Independent Man" keeps watch over a state that historically has put the ideal of individual liberty before all others. Like many ideals, this one was freighted with many meanings. As the colony grew in the seventeenth century, the belief in religious liberty and freedom of conscience espoused by its founder, Roger Williams, led to the development of political liberty and practical democracy. In the eighteenth century, that dedication to individualism made Rhode Islanders into businessmen of the first order, willing to take the big risk in hope of a bigger reward. Their land being poor in natural resources, Rhode Islanders turned to trade; accumulating wealth from traffic in rum and slaves, they built in Newport and Providence small but elegant copies of Georgian England, and worried more about taxes and currency than about religion. When they felt poorly served by British policies, they became ready revolutionaries and led in the founding of a new nation. After the Civil War, their children took individual liberty to mean economic laissez-faire, ushering in the state's golden age when Rhode Island senator Nelson Aldrich became known as the "general manager" of the United States.